How to Restore iTunes Data from Computer to iPhone, iPad or iPod touch? There are common situations that can prompt an iPhone, iPad or iPod touch user to restore their iTunes data from computer to their device. Firstly, when they lose their data on device but they have backed up the data to iTunes before. The second problem is that their iOS device is misplaced or upgraded to new one and they want to restore iTunes data to the new device. And the article will show you two ways to restore iTunes data from computer to your iPhone, no matter it is an old or new one. In the first instance, let’s discuss what iTunes can do for a user. Apple’s iTunes was originally developed to help user transfer data to their devices (iPhone, iPad and iPod). You can also use it to restore purchased files or old backup from computer to iOS device without hassle. How to do it? See the following part. 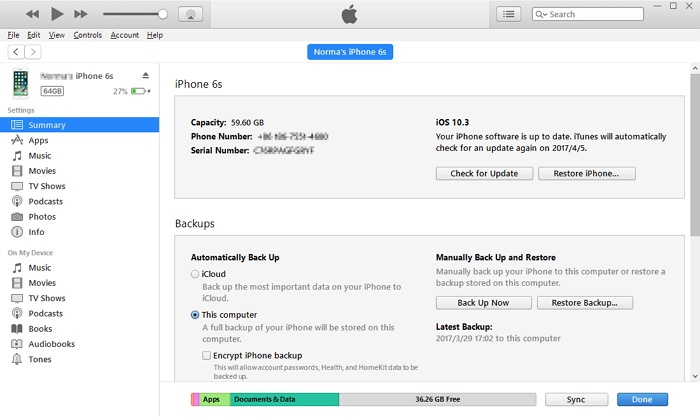 Apple has considerately offered the steps telling how to restore data from iTunes on computer to iOS devices. See the following specific procedures. 1. Open iTunes on your Mac or Windows PC that you used in backing up your device. 2. After that, connect your device to your computer with a USB cable. If a pop-up window appears asking you should enter your passcode or trust this computer, follow the prompt. Ensure that you have the latest version of iTunes that works with your computer operating system. Try each USB port on your computer to confirm is any is not faulty then try a different Apple USB cable. Restart your computer and your iPhone, iPad or iPod touch. 4. Select Restore Backup…from the Backups option on the window. If any pop up appears that your iOS device software is too old. Try to upgrade it and try again from the beginning. 5. After all the above steps have been done correctly, iTunes will show all the previous backups with date and size. Look at each of the backup histories carefully and pick the one with the most relevant one. 6. After picking the most relevant backup then, click on the Restore and wait for the restore time to be completed, if asked to enter the passcode, enter your password for your encrypted backup. 7. Make sure your device is still connected to your Mac or Windows PC till it restarts automatically and wait for sync with your computer after the sync you can disconnect your device from your pc. Restart it and you have all your previous media, data and settings back on your device. But iTunes goes wrong often. Lots of Apple users ask for help online saying that they cannot restore the iTunes data from computer to iPhone due to the iTunes’ system error. So it is necessary that we have an alternative of iTunes to restore the old backup to iOS devices. And the following will introduce a free tool which can help you do this. iMyFone D-Port Pro is a quick and reliable solution for iPhone, iPad and iPod touch backup and restore. The iPhone restore tool can do what iTunes can do for iOS users - Restore content in iTunes including messages, contacts, calendars, Camera Roll photos and videos, apps and app documents, as well as iPhone settings from computer to your iPhone – all without the need for iTunes. 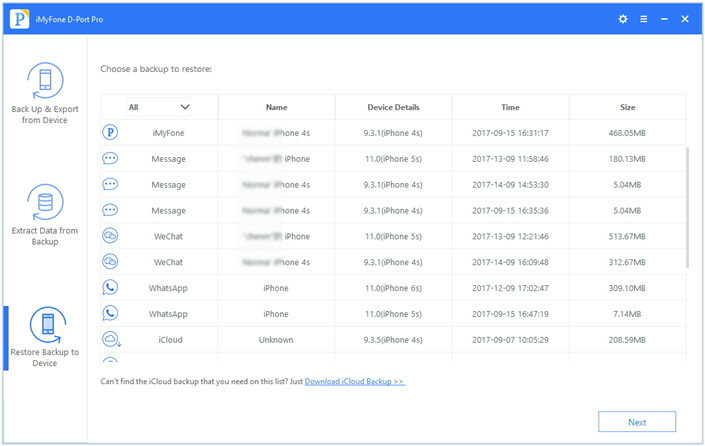 Back up and restore only messages, WhatsApp data, WeChat data from backups to iPhone without overwriting other data on iPhone. View and extract data in your old iTunes or iCloud backups and you don’t have to restore the backup. It offers free trial version for Apple users using various iPhone devices, even iPhone X and iPhone 8. And the following is the procedures to restore iTunes data from computer to iPhone, iPad and iPod touch. How to Restore iTunes Data from Computer to iPhone with iMyFone D-Port Pro? 1. Download and run iMyFone D-Port Pro on your Mac or PC. Click on the Restore Backup to Device and then choose an iTunes backup which you want to restore. 2. 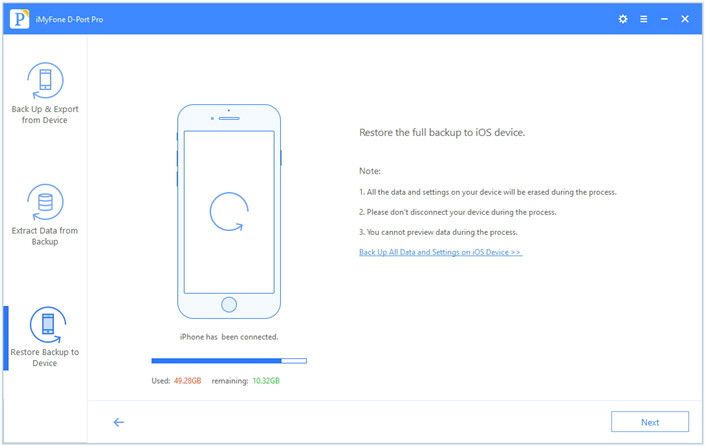 After click Next, the program will start to show you the notes about restoring the iTunes backup: all the existing data and backup on your iPhone will be replaced (so you better back up your iPhone before restoring the backup in case there is any important data). You cannot disconnect the iPhone during the process. After you confirm you want to restore the iTunes backup, click Next. 3. After the restoring is finished, the program will show you the prompt that Restore of iPhone was successful! Your device will restart now. And you can check the iTunes data on your iPhone for now. The steps above are broken into pieces in order to enable all iPhone, iPad or iPod users not to lose their files from an unexpected theft or broken phone. They are easy to be followed by any iPhone user to get their backup easily without contacting a geek or a professional to fix their device for them. Try them for now!